CRAZY DISCOUNT! Was: $259.95 Now: $109.98! Garden decor is really a pleasant activity in our daily life. Set up this Wooden Garden Bridge Pond Creek Walkway Ornament Outdoor Decor W/ Chain Rails along the walkway ground or suspend it over a pond or creek to add a new and magical style to your own yard. 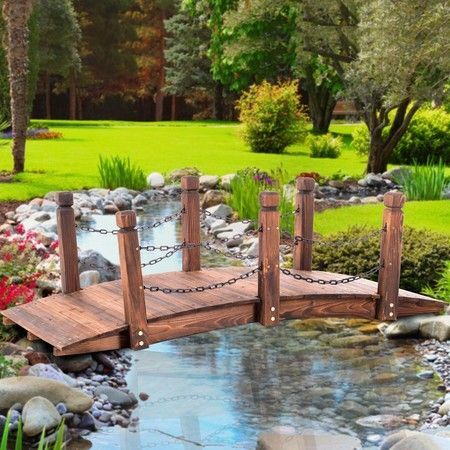 This wooden garden bridge will surely impress your family and friends with its vintage but charming appearance. Made from treated timber fir, it is built to last for years in your garden. Designed with plank material and chain rails, this garden foot bridge can support a maximum weight of 110kg. Order the decorative wood bridge now to create a playing area for your kids and a pleasant scenery for yourself. 160cm x 70cm x 51cm approx. 164cm x 28cm x 17cm approx.